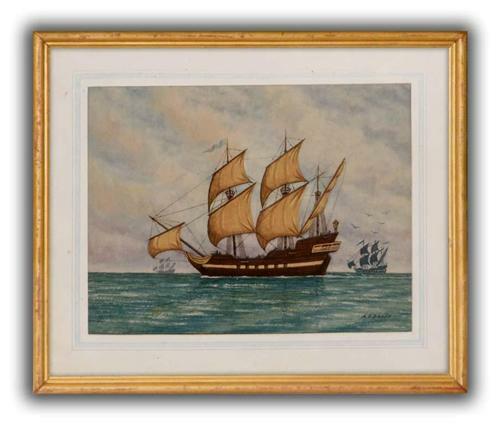 There are notes on the back of the frame which tell us that this is 'Captain Cooks Discovery'. Well (check out the pics included) it's certainly not Captain Cook's Discovery. And, although there have been a few 'Discoveries' over the years, I don't recognise this vessel. It seems to be what is generally termed a 'galleon' and that would make it of a much earlier vintage. That pedantry aside this is a very well executed watercolour; almost illustrative in the artist's attention to detail.